The number one thing people say they come to see is New Products. SEMA puts an enormous focus on their New Product Showcase. For 2015, submissions are up 100% over last year. Here’s an helpful note for Attendees: You can pick up a scanner at the New Products Showcase and scan any items that interest you. Turn in the scanner and get an immediate print out of all items and information you scanned. All for free. I asked Peter why he thought a Tire Dealer would come to SEMA, and he had an interesting take: He suggested that the automotive aftermarket is a natural crossover for tire dealers. At SEMA you will find ideas and products that can expand your business. Wheels, cold air intakes, and all kinds of other upsell opportunities are available. While that customer’s truck is in your shop, why not sell him the accessories that he’s going to buy somewhere else? These two points—about the focus on new products and the crossover appeal—combine for an interesting opportunity for those at SEMA. It is especially true for dealers that already may be headed in the direction of expanding business in this way or are thinking about it. If attending, maybe instead of just browsing you set a goal of finding the 5 best products that you think fit your business and your customers. Then as you come back home you can explore the possibility of whether they would work–next talk to some customers, test the waters, or even bring a few in as a test run. 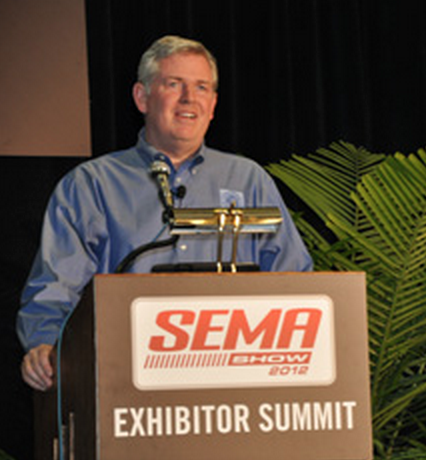 SEMA is the largest gathering of small business people in the US. That may not surprise you. What might surprise you is that it’s also the largest gathering of professional women in the US. In the past, it was mostly just spouses that attended. Now it’s shop owners, manufacturer’s reps, and buyers. SEMA is also working to bring young people into the industry. They are striving to make the show accessible and comfortable for them. They reach out via social media and their Youth Awards to recognize the next generation. I appreciate Peter MacGillivray taking time from his busy preparation for the Show and giving us his perspective. And I hope some of you find it helpful whether it’s for this year or thinking about how SEMA might benefit you or others in your business in years to come.